HALIFAX - The number of North Atlantic right whale deaths this year remains at one, as U.S. officials say a carcass found off Virginia was in fact a humpback whale. The badly decomposed carcass washed ashore in Virginia on Metompkin Island, near the Maryland border, on May 31. The U.S. National Oceanic and Atmospheric Administration said earlier this month that experts had "tentatively identified it as a North Atlantic right whale." But the U.S. agency now says tests identified it as a humpback, which means January's discovery of a dead right whale off Virginia is the lone right whale death this year. 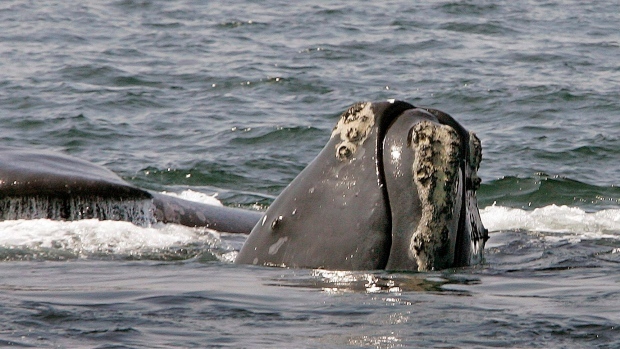 Canadian officials have closed multiple East Coast fishery zones this year to protect right whales as they migrate north for the summer, causing some frustration among fishermen. The population suffered 17 losses last year -- 12 of them in Canadian waters -- likely due to rope entanglements and ship collisions.